Form meet function in the Foreman collection. 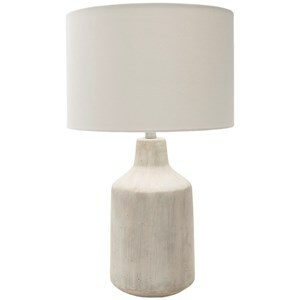 Featuring a concrete base and basic linen shade this lamp will go in well in any environment. The Foreman Painted Rustic Table Lamp by Surya at Hudson's Furniture in the Tampa, St Petersburg, Orlando, Ormond Beach & Sarasota Florida area. Product availability may vary. Contact us for the most current availability on this product. Browse other items in the Foreman collection from Hudson's Furniture in the Tampa, St Petersburg, Orlando, Ormond Beach & Sarasota Florida area.